The Kentucky National Jersey Show and Sale is in its 56th year, and will be in Louisville, Kentucky, again this year. There is a change to the date and time! 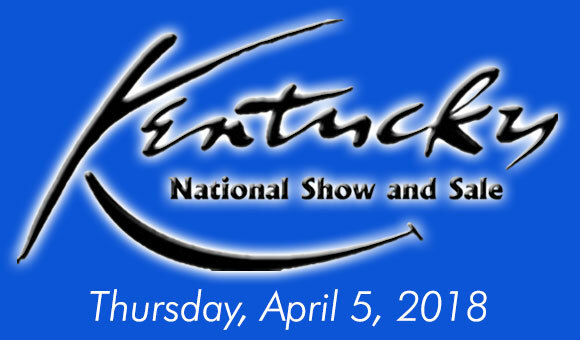 Show and Sale day is THURSDAY, APRIL 5, with the show beginning at 1:00 p.m. and the sale at 3:00 p.m. (EDT). In addition to the anticipated 50+ head in the show and sale, we also have five lots of 5 or 6 bred heifers, due anywhere from April to July. Browse the information and pick the group or groups that best suit your herd’s needs at www.jerseybid.com. Bidding is open from this evening until 3 p.m. on Thursday. The lots must meet their minimum bids in order to move to the live sale for final bidding. The entire Kentucky National Jersey Sale will also be broadcast LIVE on www.jerseyauctionlive.com. The show and sale times have been changed for the Kentucky National Jersey Show and Sale. The event will be on THURSDAY, APRIL 5, 2018, with the SHOW at 1:00 p.m. and SALE at 3:00 p.m. (EST). For the schedule of JMS Managed Sales, visit the JMS Calendar or the previous Blog Post. 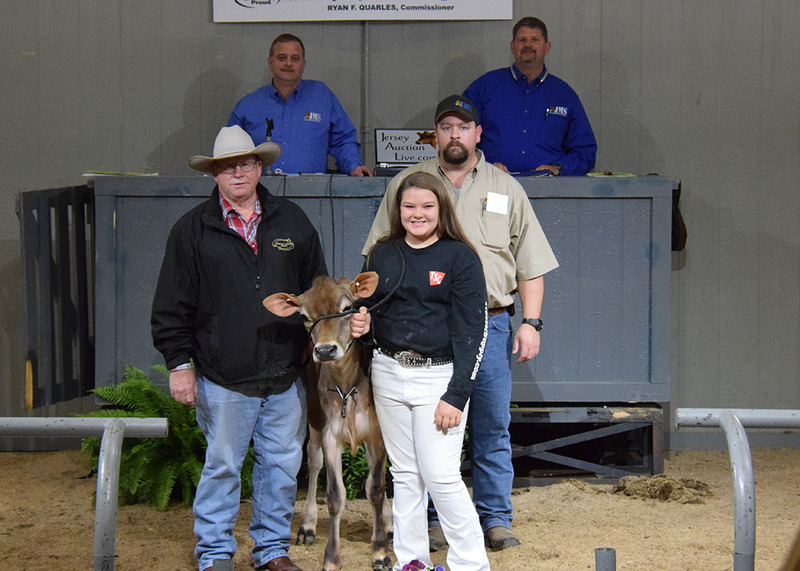 The Kentucky National Jersey Show and Sale concluded in Louisville, Ky., today with a total of 76 lots being sold for an average of $1,704. Live lots who were in Kentucky totaled 65, with nine head sold online in group lots, and one choice offering. Top selling lot of the day was also the Junior Champion of the show, Lot 63 – Billings Joel Butternut-ET. 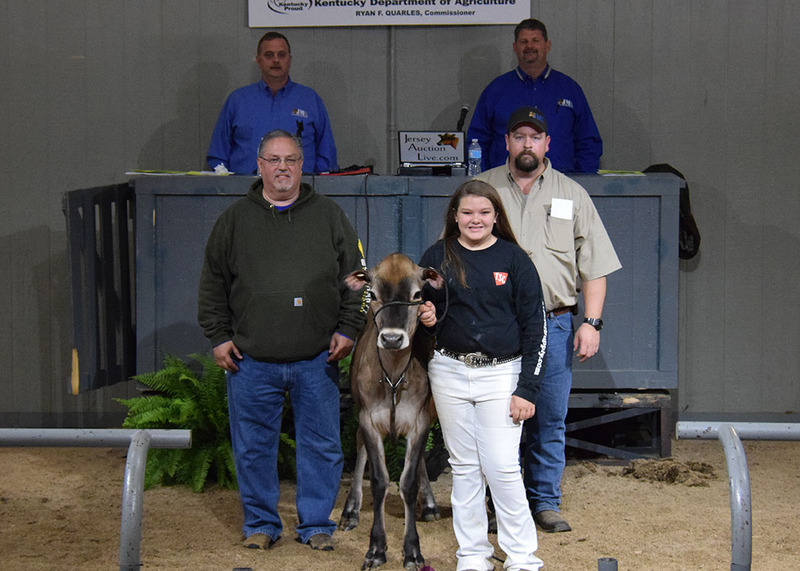 This senior calf from Billings Farm and Museum, Woodstock, Vt., sold to Kelly Jo Manion of Scottsville, Ky., for $3900. 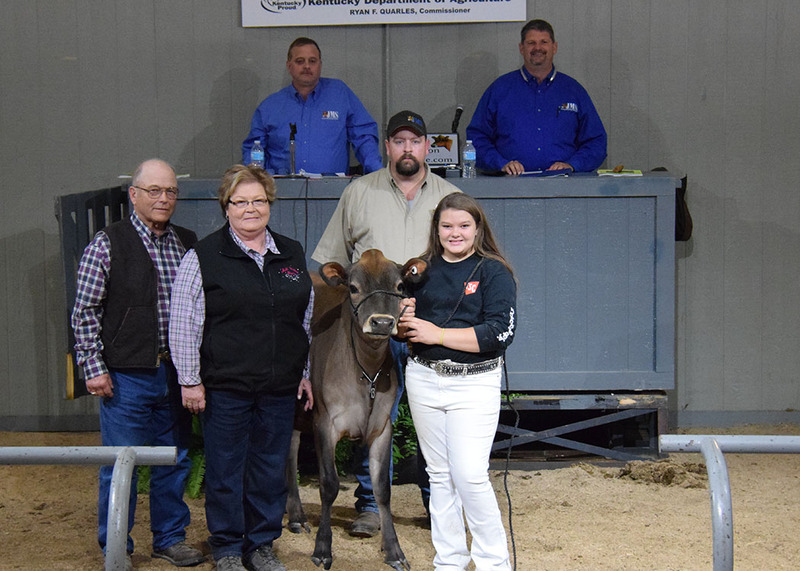 The second high lot was the Reserve Junior Champion – the Summer Yearling from John and Donna Greiwe and family, Sidney, Ohio. Lot 13 – DKG One In Million Jennie sold to Cymberly Carlson and Jason Nagel in Panama, N.Y., for $3,100. The third high selling lot of the Kentucky National Jersey Sale was Lot 65, also from Billings Farm & Museum. She was Lot 65 – Billings Grove Bessie-ET and sold to Jacob Belton, Smyrna, Tenn., for $3,050. Twelve different states consigned to the sale, with buyers representing 10 different states. Thank you to all the consignors, bidders and buyers. We wish you all the best with your new purchases!